1 1. What is marine algae? 2 2. Where is it found? 3 3. What is the organ of attachment to the substratum called? How does it differ from a true root? 4 4. How does size vary in marine algae? 5 5. Name the four groups of marine algae, indicating opposite the name of each group whether it is unicellular, multicellular, or both. 6 6. Is most green algae found in fresh or salt water? 7 7. What are diatoms? 8 8. Where does algae grow-the polar, temperate, or tropic zone? 9 9. Where is brown algae most invariably found-in fresh or salt water? 10 10. What is the greatest depth that algae grows in the ocean? Why can it not grow in deeper water? 11 11. Name the three parts of a large kelp. How do they compare to the leaf, stem, and root of a plant? 12 12. Describe the two ways that algae reproduce. 13 13. What are some of the commercial values of algae? Give at least one for each group. 14 14. Make a collection of at least twenty specimen of marine algae properly identified, mounted, and labeled. There must be at least four specimens from the Green group, eight from the Brown group, and eight from the Red group. 15 15. Be able to identify by generic name at least ten types of marine algae. 1. What is marine algae? The most common name for marine algae is "seaweed". Seaweeds are popularly described as plants, but biologists do not consider them plants (in biology, all true plants belong to the kingdom Plantae). They should not be confused with aquatic plants such as seagrasses (which are vascular plants). Marine algae are mostly found in shallow ocean water near rocky shores. It is also found in fresh water, such as ponds, lakes, and rivers. 3. What is the organ of attachment to the substratum called? How does it differ from a true root? The organ that attaches a marine algae to a substrate is called a "holdfast" Unlike a root, a holdfast derives no nutrients from this intimate contact with the substrate. Holdfasts vary in shape and form depending on both the species and the substrate type. The holdfasts of organisms that live in muddy substrates often have complex tangles of root-like growths, while those of organisms that live in sandy substrates are bulb-like and very flexible, such as the holdfast of sea pens, allowing the organism(s) to pull the entire body into the substrate when the holdfast is contracted. The holdfasts of organisms that live on smooth surfaces (such as the surface of a boulder) have the base of the holdfast literally glued to the surface. 4. How does size vary in marine algae? Some marine algae are so small they can only be seen under a microscope. Others are very large, such as Macrocystis, a species of kelp belonging to the brown algae group, which may reach 60 meters in length. 5. Name the four groups of marine algae, indicating opposite the name of each group whether it is unicellular, multicellular, or both. 6. Is most green algae found in fresh or salt water? While about 90% of the species of green algae live in freshwater habitats and most of the other 10% live in marine habitats, other species are adapted to a wide range of environments. Watermelon snow, or Chlamydomonas nivalis, of the class Chlorophyceae, lives on summer alpine snowfields. Others live attached to rocks or woody parts of trees. Some lichens are symbiotic relationships with fungi and a green alga. Diatoms are a major group of algae, and are one of the most common types of phytoplankton. Most diatoms are unicellular, although some form chains or simple colonies. A characteristic feature of diatom cells is that they are encased within a unique cell wall made of silica (hydrated silicon dioxide) called a frustule. These frustules show a wide diversity in form, some quite beautiful and ornate, but usually consist of two asymmetrical sides with a split between them, hence the group name. Diatoms are a widespread group and can be found in the oceans, in freshwater, in soils and on damp surfaces. Most live in open water, although some live as surface films at the water-sediment interface, or even under damp atmospheric conditions. They are especially important in oceans, where they are estimated to contribute up to 45% of the base of the oceanic food chain. 8. Where does algae grow-the polar, temperate, or tropic zone? Algae grow in all of these zones, from Picobiliphytes, which are an algae indigenous to polar regions, to Sargassum, which lives in the tropical waters of the Atlantic Ocean. 9. Where is brown algae most invariably found-in fresh or salt water? Brown algae is found in most salt water ecosystems. 10. What is the greatest depth that algae grows in the ocean? Why can it not grow in deeper water? The deepest living algae are those that are attached to the sea-bed under several meters of water. The limiting factor in such cases is the availability of sufficient sunlight to support photosynthesis. The deepest living seaweeds are the various kelps. 11. Name the three parts of a large kelp. How do they compare to the leaf, stem, and root of a plant? The blade is a large, flat structure, and is analogous to a plant's leaves. The stipe serves as a stem to which the blades are attached. The holdfast is the part of the plant that anchors it to a substrate, such as a rock or the seafloor. It is analogous to a plant's root. 12. Describe the two ways that algae reproduce. Most forms of algae reproduce sexually by forming spores. The spores, when cast off the adult organism, develop into male and female gametes which carry only half the genetic information of the parent organism. These gametes are motile, meaning they can move around by themselves, propelled by tiny flagella. When male and female gametes from the same or from different parent organisms combine, the genetic material fuses to create an organism with a full complement of genetic material. This is very similar to the way that ferns reproduce (see the Ferns honor for more details. Asexual reproduction is advantageous in that it permits efficient population increases, but less variation is possible. Sexual reproduction allows more variation but is more costly because of the waste of gametes that fail to mate, among other things. Often there is no strict alternation between the sporophyte and gametophyte phases and also because there is often an asexual phase, which could include the fragmentation of the thallus. 13. What are some of the commercial values of algae? Give at least one for each group. Most cultures with access to Porphyra, a genus of red algae use it as a food or somehow in the diet, making it perhaps the most domesticated of the marine algae. Gelatinous extracts of carrageen seaweed (also known as Irish moss, a red algae) have been used as food additives for hundreds of year. It acts as an emulsifier, which is to say, it help combine items which resist combination, such as oil and water. It is commonly used in toothpaste, ice cream, milkshakes, sauces, and even shampoo (which we admit is not a food). Seaweed, particularly bladderwrack, kelp or laminaria (which are all forms of brown algae), can be either applied to the soil as a mulch (although it will tend to break down very quickly) or can be added to the compost heap, where it is an excellent activator. Laminaria (a genus of brown algae) is used in the production of potassium chloride and iodine. Dried laminaria sticks can be used medicinally to induce dilation of the cervix. An additional medicinal use of algae is the product agar which is used as a culture medium for growing bacteria in laboratoy settings. The natural pigments produced by algae can be used as an alternative to chemical dyes and coloring agents. Many of the paper products used today are not recyclable because of the chemical inks that they use, paper recyclers have found that inks made from algae are much easier to break down. There is also much interest in the food industry into replacing the coloring agents that are currently used with coloring derived from algal pigments. In Israel, a species of green algae is grown in water tanks, then exposed to direct sunlight and heat which causes it to become bright red in color. It is then harvested and used as a natural pigment for foods such as Salmon. 14. Make a collection of at least twenty specimen of marine algae properly identified, mounted, and labeled. There must be at least four specimens from the Green group, eight from the Brown group, and eight from the Red group. The best approach for meeting this requirement is to obtain a field guide to algae, go out to a beach, and collect the various types you find. Once you have a specimen, use the field guide to try to identify it. Continue collecting until you have at least 20 specimens you can identify, being absolutely sure to remove any animals living in the algae before you leave the area. You can collect the specimens in a bucket or keep them in plastic bags. Rinse the alga to remove salt, sand, and foreign particles. place one of the small pieces of plywood on a work surface and cover it with a layer of blotter paper (or newspaper). Fill the shallow pan with water and float the mounting paper in it. Float the algae specimen on the mounting paper, spreading the fronds out as best you can. Carefully lift the mounting paper with the algae specimen out of the water, draining off the water as you lift it up. Lay the mounting paper on the blotter paper placed on the sheet of plywood earlier. Put your name and the specimen's identity on the mailing label, and place it on the wax paper. Cover this with another layer of blotter paper and/or newspaper. Repeat for each sample, stacking them on atop the other, separated by blotters. When the last specimen has been covered, lay the second piece of plywood over assembly. Bind the "sandwich" with the nylon straps or belts, and tighten as best you can. Alternately, you could use C-clamps to clamp the sandwich together, or you could place heavy weights on the entire assembly. Many types of algae have natural adhesives in them that will cause them to stick to the mounting paper all by themselves. For those that do not, a small dot of white glue may be used to affix them to the mounting paper. Label with the information collected about the specimen. 15. Be able to identify by generic name at least ten types of marine algae. The "generic" name in the requirement means that you should learn which genus ten specimens belong to. Don't be scared of the scientific names (Latin names) - they are no more difficult to learn than the common names, especially if you know neither when you start. We present several species below, but you should not expect that these are the only samples you will find. Get a good field guide and identify the algae you find rather than trying to find the algae you can identify. Description: Ulva lactuca is a thin flat green alga growing from a discoid holdfast. The margin is somewhat ruffled and often torn. It may reach 18 cm or more long though generally much less and up to 30 cm across. The membrane is two cells thick, soft and translucent and grows attached, without a stipe, to rock via a small disc-shaped holdfast. Green to dark green in color this species in the Chlorophyta is formed of two layers of cells irregularly arranged, as seen in cross section. The chloroplast is cup-shaped with 1 to 3 pyrenoids. Description: The genus has thalli of two forms, either erect or prostrate. The erect plants are dichotomously branched to 40 cm long with branches forming a compact spongy structure, not calcareous. The final branches form a surface layer of close palisade cortex of utricles. The non-erect species form either a prostrate or globular thallus with a velvet-like surface, the final branches forming a close cortex of utricles. Description: The name water net comes from its shape, which looks like a netlike hollow sack. It can grow up to several decimeters. Description: The name Pediastrum means "plain star", because this alga is very much star-shaped. It can be found in many ponds, making the water appear greenish. Where found: Volvox is found in ponds and ditches, and even in shallow puddles. The most favorable place to look for it is in the deeper ponds, lagoons, and ditches which receive an abundance of rain water. It has been said that where you find Lemna, you are likely to find Volvox; and it is true that such water is favorable, but the shading is unfavorable. Description: Volvox is one of the best-known chlorophytes and is the most developed in a series of genera that form spherical colonies. Each Volvox is composed of numerous flagellate cells similar to Chlamydomonas, on the order of 1000-3000 in total, interconnected and arranged in a glucoprotein filled sphere (coenobium). The cells swim in a coordinated fashion, with a distinct anterior and posterior - or since Volvox resembles a little planet, a 'north and south' pole. The cells have eyespots, more developed near the anterior, which enables the colony to swim towards light. Description: Sargassum muticum is a large brown seaweed of the Division Phaeophyta. It grows attached to rocks by a perennial holdfast up to 5 cm in diameter. From this holdfast the main axis grows to a maximum of 5 cm high. The leaf-like laminae and primary lateral branches grow from this stipe. In warm waters it can grow to 12 m long, however in British waters it grows to no more than 4 m long. The holdfast gives rise to a single main axis with secondary and tertiary branches which are shed annually. Numerous small 2-6 mm stalked air vesicules provide buoyancy. The reproductive receptacles are also stalked and develop in the axils of leafy laminae. It is self fertile. Description: Macrocystis is a genus of kelp, some species of which are so huge that the plants may grow to up to 60m. The stipes arise from a holdfast and branch three or four times from near the base. Blades develop at irregular intervals along the stipe. M. pyrifera grows to over 45 m long. The stipes are unbranched and each has a gas bladder at its base. Description: Padina pavonica, commonly known as Peacocks tail, is a brown alga found in Atlantic Ocean. It is known to act as an elastin precursor when applied topically, signaling collagen production in the skin, thereby increasing the skin's elasticity. Description: Fucus spiralis is olive brown in color and similar to Fucus vesiculosus and Fucus serratus. It grows to about 30 cm long and branches somewhat irregularly. It attached by a discoid holdfast. 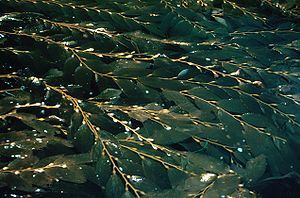 The flattened blade has a distinct midrib and is usually spirally twisted without a serrated edge, as are to be seen in Fucus serratus, and it does not show air-vesicles, as is Fucus vesiculosus. Where found: Fucus vesiculosus is one of the most common algae on the shores of the British Isles. It is recorded from the Atlantic shores of Europe, the Baltic Sea, Greenland, Azores, Canary Islands and Madeira. It also appears on the Atlantic coast of North America from Ellesmere Island, Hudson Bay to North Carolina. Description: Fucus vesiculosus is a very variable alga. It can grow to 100 cm or more and is easily recognized by the small gas–filled vesicles which occur in pairs on either side of a central midrib running along the center of the strap-like frond. It was the original source of iodine, discovered in 1811, and was used extensively to treat goiter, a swelling of the thyroid gland related to iodine deficiency. A common food in Japan, bladder wrack is used as an additive and flavouring in various food products in Europe. 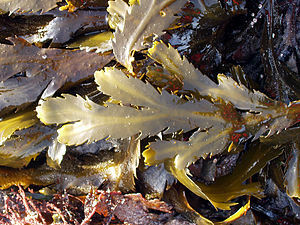 Bladder wrack is commonly found as a component of kelp tablets or powders used as nutritional supplements. It is sometimes loosely called "kelp", but that term technically refers to a different seaweed. Description: Fucus serratus is a seaweed of the north Atlantic Ocean, known as toothed wrack or serrated wrack. It is olive–brown and similar to F. vesiculosus and Fucus spiralis. It grows from a discoid holdfast. The fronds are flat, about 2 cm wide, bifurcating, and up to 1 m long including a short stipe. The flattened blade has a distinct midrib and is readily distinguished from related taxa by the serrated edge of the fronds. It does not have air vesicles, such as are found in F. vesiculosus, nor is it spirally twisted like F. spiralis. Where found: It is common on the northwestern coast of Europe (from Svalbard to Portugal) including east Greenland  and the northeastern coast of North America. Description: Ascophyllum nodosum is an edible seaweed of the northern Atlantic Ocean. Ascophyllum nodosum has long fronds with large egg-shaped air-bladders set in the fronds at regular intervals and not stalked. The fronds can reach 2 m in length. They are attached by a holdfast to rocks and boulders. The fronds are olive-brown in color and somewhat compressed but without a mid-rib. This seaweed grows quite slowly and can live for several decades; it may take approximately five years before becoming fertile. Where found: Chondrus crispus grows abundantly along the rocky parts of the Atlantic coast of Europe and North America. It can also be found in the Northern Pacific Ocean and parts of the Mediterranean. Description: Chondrus crispus is a relatively small red algae little more than 20cms long growing from a discoid holdfast and branching in a dichotomous, fan-like, manner four or five times. The morphology is very variable, especially the broadness of the thalli. The branches are 2 - 15 mm broad, firm in texture and dark reddish brown in color bleaching to yellowish in sunlight. In its fresh condition the plant is soft and cartilaginous, varying in color from a greenish-yellow to a dark purple or purplish-brown; but when washed and sun-dried for preservation it has a yellowish translucent horn-like aspect and consistency. The principal constituent of Irish moss is a mucilaginous body, of which it contains about 55%; the plant also has nearly 10% of protein and about 15% of mineral matter, and is rich in iodine and sulphur. When softened in water it has a sea-like odour, and because of the abundant mucilage it will form a jelly when boiled, containing from 20 to 30 times its weight of water. 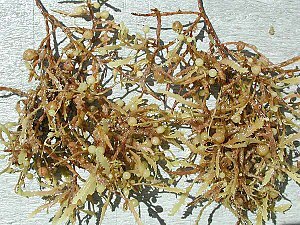 Irish moss is a major source of carrageenan, which is commonly used as a thickener and stabilizer in milk products such as ice cream and processed foods. 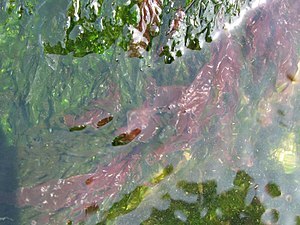 Description: Porphyra is a foliose red algal genus of laver, comprising approximately 70 species. It grows in the intertidal, typically between the upper intertidal to the splash zone. In East Asia, is used to produce the sea vegetable products nori (in Japan) and gim (in Korea), the most commonly eaten seaweed. It is considered that there are 60 to 70 species of Porphyra worldwide and seven in the British Isles. Seaweed Lady on Flickr has many photos of various seaweeds.